This installment of the Worst to First Jerseys features the Columbus Blue Jackets, and part of this series is hosting the full posts on a blog of the team that’s being featured. The full version of this post was originally posted on the blog The Cannon, but is now also here below. You can check it out at The Cannon by clicking here. Columbus, which shares the title with Minnesota for being the league’s youngest franchise, don’t have a ton of different jerseys to their name. But they’ve got more than one, so if there’s a countdown list to be made, then let’s make it. And besides, some of the changes that the Blue Jackets have made to their jerseys over their 14 years in the league are among the best and worst in the league. Got your interest? Good…let’s get this list going. Third jerseys have a pretty sordid history, with the earliest third jerseys being among some of the worst jerseys the league has ever seen. But some third jerseys are also pretty excellent, as the St Louis Blues proved in their recent Worst To First post. These aren’t even close to being the worst third jerseys ever, but obviously (as they’re in last place) they’re not really that great either. As third jerseys go, they’re decidedly uninteresting. In that sense, they’re a real missed opportunity to do something interesting and play on the Civil War history for which the team is named. 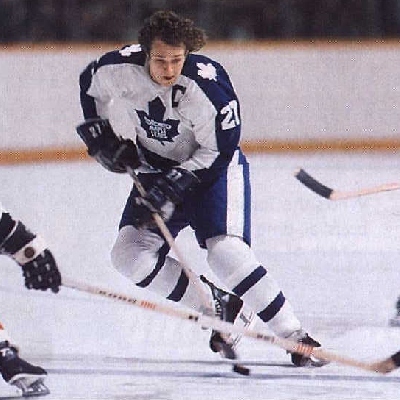 Instead, they gave us a slightly modified version of the regular home and away jerseys they wore during this era. Well, hey, at least they didn’t put Stinger on the front or anything. The straight cuff-to-cuff shoulder yoke looks dated, as it’s mostly a by-product of the NHL in the ’80s. What’s worse, they made the yoke (and the large stripe at the bottom of the jerseys) black. When sitting right beside the navy blue that takes up the rest of the jersey, there’s not a whole lot of difference between the tone of the colours, so really, what’s the point as it does nothing to add any interest or contrast to the jersey. And contrast is important. Making the yoke red, white, or even grey, would have been infinitely more interesting. 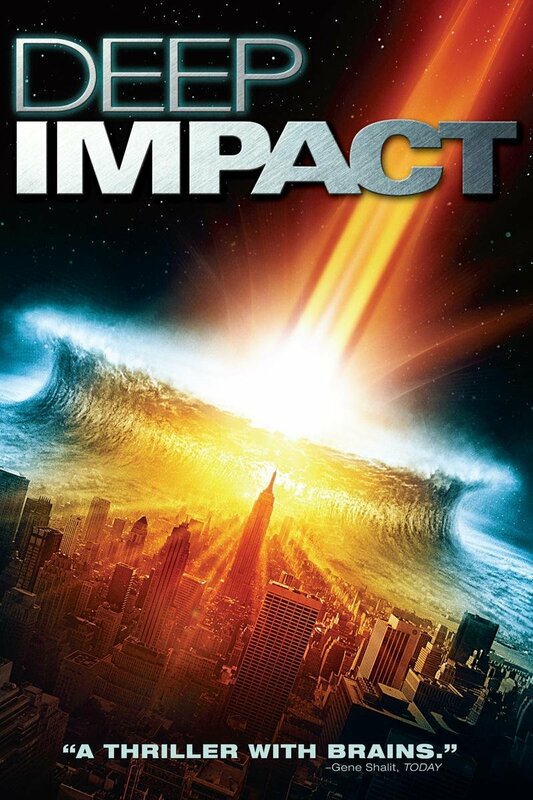 Or, at least, impactful. Other than that, it’s a pretty straight-forward jersey. The stripe patterns are relatively simple and consistent, and having a very thin white and red stripe is a solid choice to add some contrast to the jersey. The stars going down the sleeve are a nice touch (and similar to the jerseys for a team that also just got the Worst to First treatment) as it calls on the design of the Ohio state flag, and of course, the Blue Jacket’s main logo crest. Collar laces are almost always a good thing, unless they’re fake. It’s a relatively simple and – because of that – a boring design for a third jersey, feeling more like a cash grab for jersey sales rather than an actual good addition to the can(n)on (get it, double entendre?) of Blue Jacket’s jerseys. And this complete missed opportunity is the main reason it’s ranked last on the list. Design is not just about design, but also partly about the context around the design. 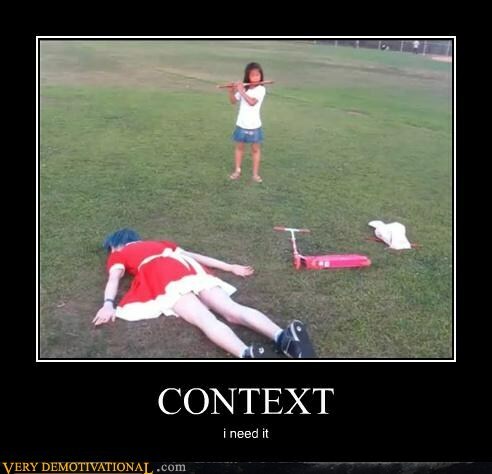 Context is everything. 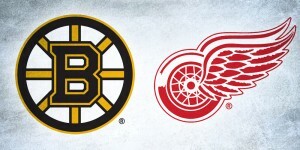 At least they used the better (and current) logo design, which is still not that great. Jersey Recommendation: #9 Vyborny. One of the few players who could really contribute offensively during this era for the Blue Jackets, and since Columbus was the only NHL team he played for before heading to the KHL, he gets the nod here. Hey, he even outscored Rick Nash for a couple seasons. 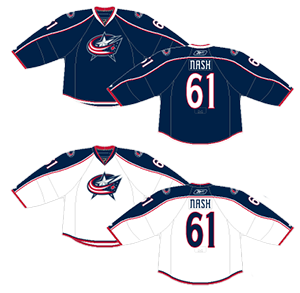 The Blue Jackets’ inaugural jerseys share many of the characteristics of the previously discussed jerseys. 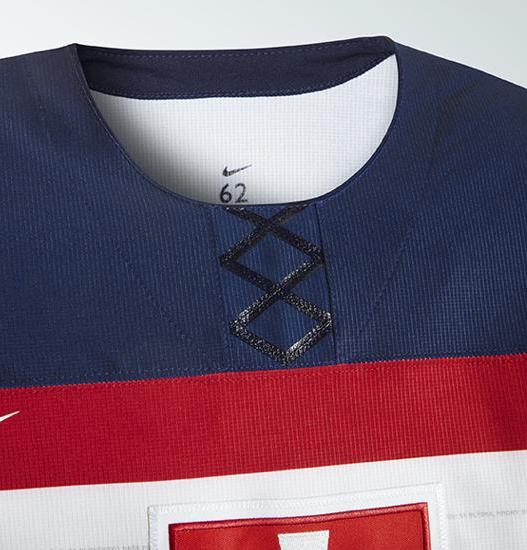 For one, there’s the straight cuff-to-cuff shoulder yoke on the white jerseys. 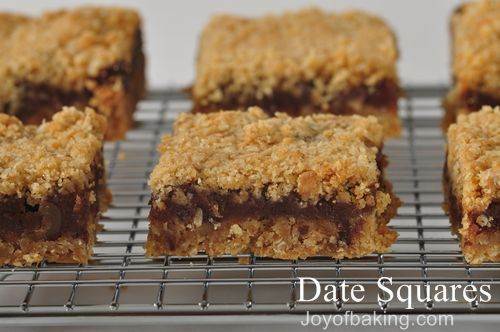 Just like the third jerseys, it looks like delicious dessert squares: very dated. But for the most part, these are a very safe hockey jersey design: a simple solid striping pattern on the bottoms of the jerseys, with coloured shoulder yokes on the white jerseys with some shoulder patches showing an alternate logo. There’s a couple stripes around the collar to match as well. It’s a pretty standard traditional jersey, so there’s not much to like, or not like, about it. But there’s still a couple design elements that do make it more distinctive than a classic jersey, and mostly in a negative way. 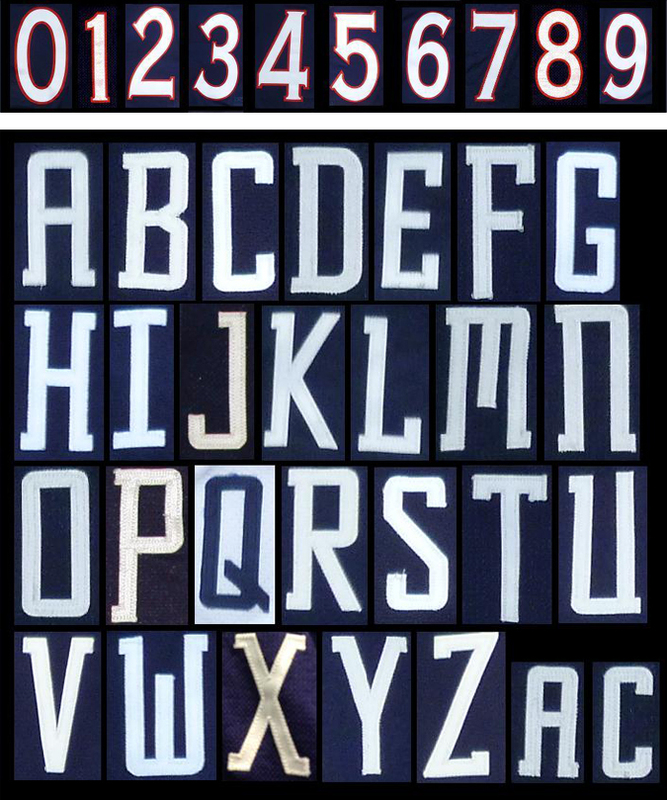 First, the typefaces used on the jerseys. They’re very unique in the league for actually using two completely different typefaces for the numbers and the nameplates. Sometimes, being unique is great. This is one of those times when it’s not great. It’s not that obvious from the image of the jerseys above, but if you look at this image here, you can see the comparison of the numbers and the letters used on these jerseys. The numbers use a typeface that is serifed (it has small pointed elements coming out of the ends of the numbers) while the letters use a slab-serifed font, where the elements coming out of the ends of the letter are thick and of similar thickness as the rest of the letter. And this typeface is very oddly shaped. That M just looks stupid. But not only that, there’s almost no similarities in the structure between the letters and numbers. The easiest way to see it is to compare the number 0 with the letter O. The zero is very rounded, the letter O is very squared, and that shows the underlying structure of all the numbers and letters. And yes, that’s a problem, because it shows a lack of identity and clarity in the brand. The third jerseys previously discussed have the exact same problem. Enough geeking out over fonts. The other different element on these jerseys is the very thin half-stripe at the cuff of the jerseys, with the stars in them. 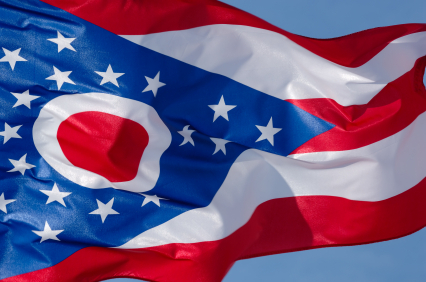 It’s pretty clear why that element is there, again drawing from the design of the Ohio state flag, but it’s small and too subtle. It’s one of the elements that their third jersey handled better. Overall, it’s a very unoffensive jersey, with a few offensive elements. 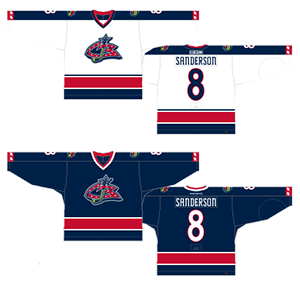 Jersey Recommendation: #8 Sanderson. These were tough times for the expansion franchise, with a contract rotation of players coming in and out and no real stars. But Sanderson stuck around for parts of 5 seasons during this era and was one of the first Blue Jackets ever, taken during the 2000 Expansion Draft. Get it in the white jersey. Their current primary jerseys are basically a slight re-working of their original jerseys. Some elements have changed slightly, but they took advantage of the introduction of the Reebok Edge jerseys to modernize the design, mostly in positive ways. The cuff-to-cuff shoulder yokes are still there, and also added to the blue jerseys, but they’ve been given a slight wave to them making them look more modern. The thin striping around the yokes is a great subtle addition to the jersey as well. It was one of the few things that worked on the third jersey already discussed and it works here too. Those thin stripes are also mimicked at the cuffs and along the bottom of jersey, creating a more consistent design that works with the new lines on the Edge jerseys. The star on the sleeve is still there, but it’s been reduced to one star and the design is a combination of the previous two jerseys discussed, which makes it more subtle than the third jerseys, but less subtle than the original jerseys. Which becomes the best handling of it yet. You can see it better here. Jersey Recommendation: #61 Nash. Okay, maybe he’s not so popular in Columbus these days since jumping ship for the Rangers, but he’s easily the best player to ever wear a Columbus jersey, holding most of the franchise’s offensive records. Get it in the home blues. 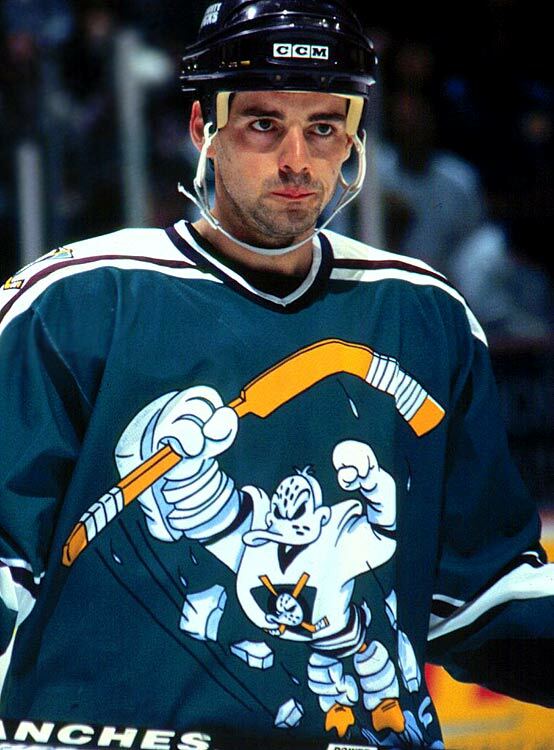 Remember how the original third jerseys represented a completely missed opportunity? Columbus’ second stab at a third jersey represents the exact opposite. They took advantage of the third jersey format to create a jersey that further established the Blue Jackets’ historical identity and looked more like an honest attempt at creating something unique and less like a jersey cash grab. 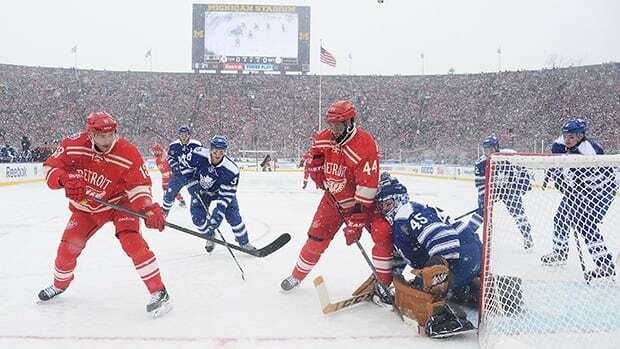 Heritage jerseys are all rage these days because of both the Winter Classic and Heritage Classic jersey designs. 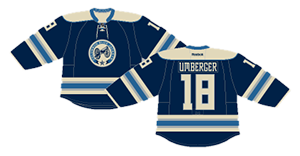 Columbus, based on their name and chosen identity, is one of the few teams in the league that can actually lay claim to a heritage jersey, and they go full throttle with it here. The creamy off-white automatically makes it look historical. 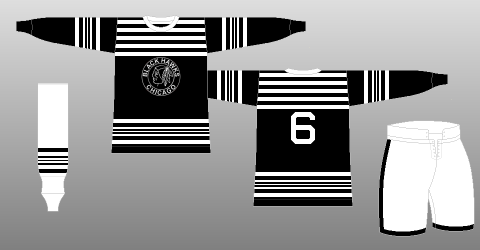 The striping patterns are super-duper-stripey, which is also historical if you look at hockey jerseys from the 1930s. At least it’s consistent across the whole jerseys, on the sleeves and along the bottom. The shoulder yokes are simple and classic. 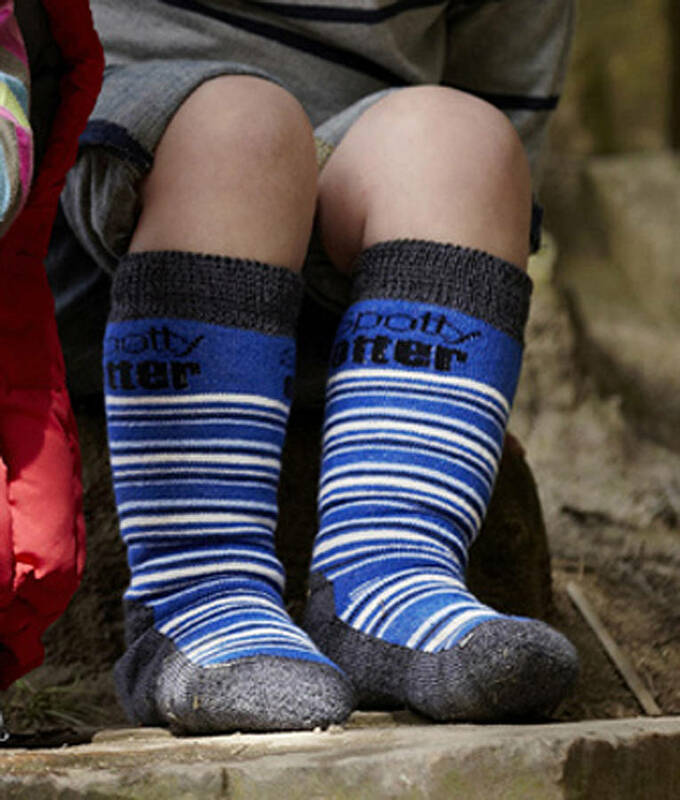 And there’s laces, which are always a good thing. Again, unless they’re fake. Using just two tones of blue (and removing red from the equation altogether) makes it look deceiving simple as well, adding just enough visual interest to keep it from being boring. Being named the Blue Jackets, it also just makes sense. 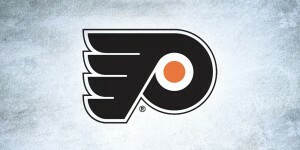 But the real star here is the alternate logo, which is one of the best in the league. It’s way too complex and ornate to be used as a primary logo, but as an alternate, it’s awesome, using the retro-historical look that’s trendy right now, and also being copied by other teams around the league (I’m looking at you Minnesota and St Louis). And using a cannon is both historical and connected to the cannon blast that goes off in the arena. It establishes a brand that Columbus can be proud of. This jersey marks the first time that Columbus actually used a different font for the numbers, one that is at least slab-serifed and more closely matches the font on the nameplates. It’s still a mis-step as there’s nothing really historical about the typeface at all, making it look more digital and modern. But at least it’s a little closer to the other typeface. This is easily Columbus’ best jersey and one of the best third jerseys in the entire league as well. Jersey Recommendation: #27 Murray. Celebrate the Blue Jackets’ historical jerseys with their future star on defense. By all accounts, he should be a stud and leader on the team in the future. What do you think is the biggest goal scored in Blue Jackets’ history? Or, what’s the most memorable play-by-play call made for a big Blue Jackets goal? 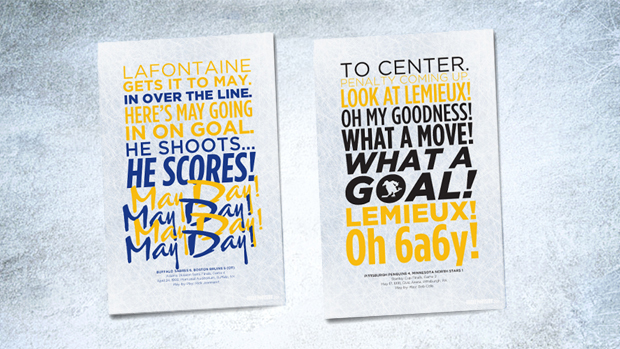 Let us know in the comments below and it could be epitomized as a poster similar to these ones, available at the Hockey By Design store. 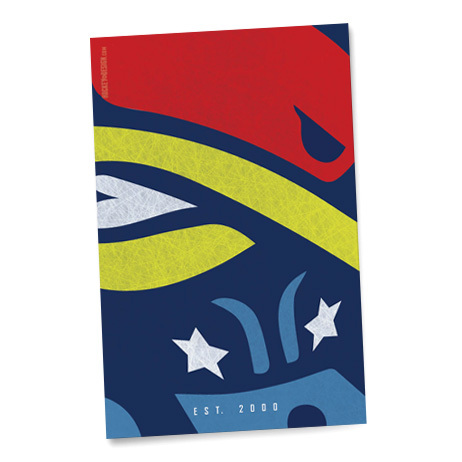 Also, now available at the store, made specifically for this post, is a Blue Jackets entry into the Vintage posters series, pictured here. You can buy yourself one right here. Still haven’t figured out why the jackets wear red pants (except they were trying to look like the rangers I think when they came into the league). I think their regular home and away (love the logo)uniforms should have blue pants. If they want red in there, they can use it for trim on the pants! A good point. But maybe because they’re only the Blue Jackets? The red brings out the Americana a little more. Why do the Blackhawks wear red jerseys? The jersey is way more important than the shorts (I call them shorts because they are the same length as regular shorts … unless you’re the Flyers). However, Chicago’s jersey are classics, but they’re still red. Also, Dallas, STARS ARE NOT GREEN!!!!!!! 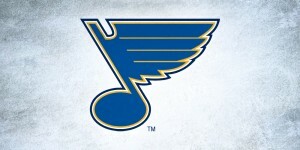 At least St. Louis knows its colors. My first comment reply to any website ever! Yay! In the early 19th Century, the US Army assigned colors to each branch. The artillery was assigned scarlet. Until the introduction of olive-drab for WWI, artillerymen wore red stripes on their uniform pants and earned the nickname “Redlegs.” Today, in order to keep with tradition, artillerymen wear red socks in their dress uniforms to keep the Redleg spirit alive. The Blue Jackets not only have a cannon in their alternate logo, but they fire one inside NWA for all goals and other celebratory happenings. So, they may be the Blue Jackets, but they are Redlegs, hence the red breezers. Good to know, thanks for sharing that! This does not mean that they never want to spend time with you. Dermatitis, or skin illness, is 1 of the most common problems that people have. Anybody from any stroll of lifestyle can be a child molester. I don’t get why you say the Blues and Wild copied the Jackets with a circular logo. Both teams had them about 3 years before the Jackets caught up with them. So really, the Jackets copied and when you look at it, there jersey shares a strange resemblance with the Blues 3rd jersey.